UK news company The Guardian has launched a campaign promoting “Guardian Goggles”, an augmented reality device. Alan Rusbridger, editor in chief, unveils the latest exciting step in the Guardian’s mission to harness the power of online media: a pair of web-connected “augmented reality” spectacles that will beam its journalism directly into the wearer’s visual field, enabling users to see the world through the Guardian’s eyes at all times. 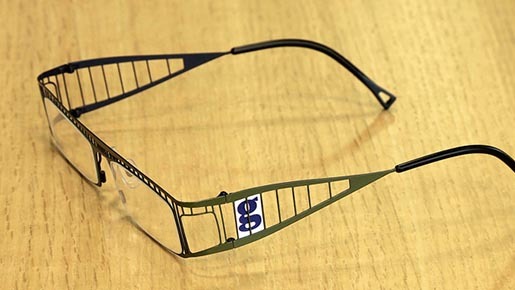 Guardian Goggles incorporate translucent screens in the lenses, overlaying the wearer’s view of their surroundings with a real-time stream of specially curated opinions from the paper’s reporters, critics and commentators. For example, simply by looking at the outside of a restaurant or cinema and pointing, the user can call up relevant Guardian reviews of the food or current films. Another Goggles app, currently in development, will allow readers with strong feelings about postings on the Guardian’s Comment Is Free site simply to yell their objections out loud, for example in the street, or on a bus. A voice-recognition system will then add their opinions to the relevant web page within 30 seconds. An algorithm designed to detect frequently recurring viewpoints, for example, that the Guardian should not be wasting valuable internet space by running blog posts about fashion or celebrities, will enable those to be added to the site even faster. A limited-edition designer model, evoking the shape of the letter “g” from the Guardian’s masthead, has been specially created by a collective of avant-garde designers working in association with Christopher Biggins. Guardian Goggles’ impressive battery life enables them to be used for up to three hours at a time. To facilitate easy recharging for even longer periods of use, the paper plans to place unobtrusive charging stations on street corners in parts of London, Brighton and Bristol, where users may plug in their glasses without even needing to remove them.